HaHa Moment: What Causes White Spots on Fingernails? There are many myths surrounding those mysterious white spots on fingernails that occasionally show up, but the simple truth is that the majority of white spots on fingernails are caused by a previous injury to the nail bed. They can be loosely compared to bruises on the skin. If you notice white spots, also known as leukonychia, on your nails, they unlikely to have been caused by a vitamin or mineral deficiency. In a few cases, white spots on fingernails can indicate an underlying infection, but much more commonly, they are the result of injury. Similar to bruising, white spots on fingernails do not show up immediately. It may take several days or weeks before you notice the spots. Because they are generally the result of a minor injury, you are likely to have forgotten all about banging your fingernail against the car door. White spots on fingernails are usually not the result of serious injury to the nail, such as being hit with a hammer, which would more likely result in dark blue to black spots and possible necrosis or death of the nail tissue. 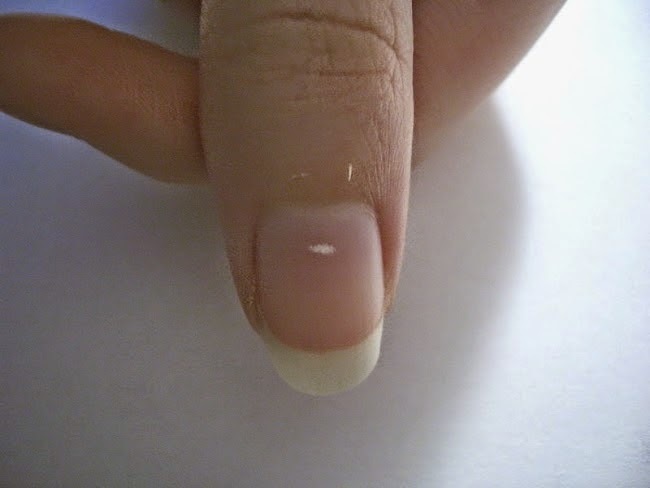 Fingernails grow at an average rate of half an inch per month, so most visible injuries to the nail take about eight weeks to grow out completely. Sometimes, white spots on fingernails fade before they completely grow out.